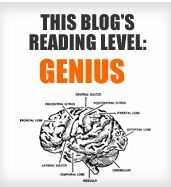 If you read Podcasting News, you’re a genius, according to the Blog Readability Test. The test offers a readability rating, based on the level of education needed to read a blog or site. We always knew you were smart!